On April 2, ‘Series of Lectures for Innovative Leaders’ was held, and the first lecture was given by Professor Emeritus Song Inseop, Department of General Education. The lecture series was limited to participants who pre-registered for the program. The lecture titles were ‘Future Design Strategies and the Way to Know Oneself' by Professor Song Inseop, ‘Understanding the Social Economy’ by Chairperson Cho Jaesuk, and ‘Women and Sookmyungians, the Power to Change the World’ by Assemblyperson Ryu Jiyoung. The three lectures were held on alternative evenings until April 18. 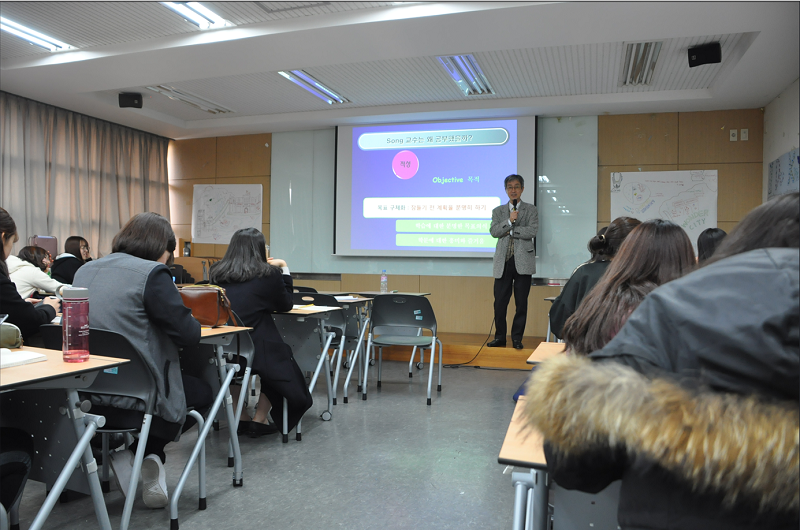 On April 6, Professor Emeritus Song spoke in the Myungshin Building Room 605 at 1 p.m. 80 students listened to his talk, and Professor Song who retired from Sookmyung Women’s University 5 years ago began his session with the ‘Solveige’s Song’, which lightened the mood considerably. He said that he hopes Sookmyung and its students would develop the beauty relationship shared by the boy and girl of Solveige. He also emphasized that Sookmyungians had better make ourselves with Sookmyung Women’s University for 4 years, and making their own ego in subject self-conception while overcoming negative glances of our objective self-conception is important. In addition, he introduced to students a number of famous sayings such as ‘Every new student is a champion’ and ‘History doesn’t advance itself. Only I as a human being can make history advance.’ During the last half of his lecture, he explained how to make strong decisions about one’s future, the strategies that could make that future happened, and the way to success academically. Lim Hyejin, Department of Dance ’18, offered her thoughts on the lecture: “I was so impressed with the first song ‘Solveige’s song’. Also, I realized that I need to truly know myself before embarking on a career in order to choose a career that I will love doing.” Professor Emeritus Song continuously highlighted the idea ‘I am, who I am’ throughout his lecture, and it made students contempt deeply who they really are. After the lecture, Song provided his personal contact information so that students could contact him if they wished to ask more questions or get additional advice about life. The lecture was a good chance for students to gain advice and direction about their future.